It was a lazy sunday morning. But one cannot feel too lazy with a four-year old waiting for food. After a hot cup of ragi kanji/finger millet porridge made with milk (recipe in future), it was time for brunch or a proper lunch. I had made nothing. No special meen kuzhambu/fish curry; no biriyani; no sambhar, no rasam – the usual traditional lunch sequence. (C’mon we need our Sundays too.) Why not something simple yet different; not too time-consuming, but would come under a whole meal category, especially nothing less than expected! Then came a picture of thuvayal, chicken kuzhambu (chutney/chicken curry) and sivapparisi/brown rice platter! Mildly spiced Pudhina Kadalai Thuvayal – Mint Peanut Thuvayal doesn’t need seasoning or tempering with mustard seeds and black gram when the thuvayal is served with rice. What is the difference between thuvayal and chutney? I do not know a definite answer to this. But I have always thought thuvayal is the tamil name for chutney. The thuvayal served as accompaniment for idlies, dosais, uppumas and pongal can be of a little watery consistency. Thuvayal served with rice is a thick paste and a bit coarse too. 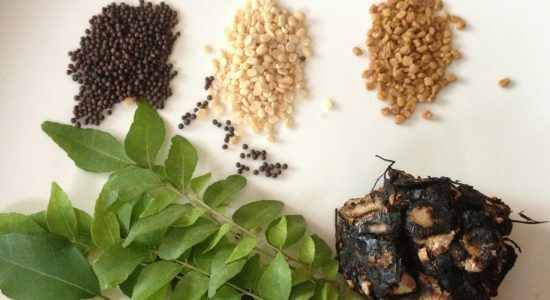 ‘Chutney’ has become a universal term for thick pastes, pickles and sauces, ‘Thuvayal’ has become a term in Tamilnadu, associated more with those chutneys had with rice. Now, back to our pudhina kadalai thuvayal.. This is a thick thuvayal to be had with steaming hot rice. Generally, thick thuvayal and rice would be had with a combination of a gravy/ kuzhambu or kootu (vegetable and lentil stew). This is for a perfect blend of a thick chutney with a gravy stew for easy consumption and digestion too! For the gravy dish or kuzhambu to go with rice and thuvayal, I made a quick and easy chicken fillet kuzhambu! Once in room temperature, make a coarse paste with roasted peanuts, salt and water. Usually mint leaves are fried till they shrink. I prefer just before they shrink. 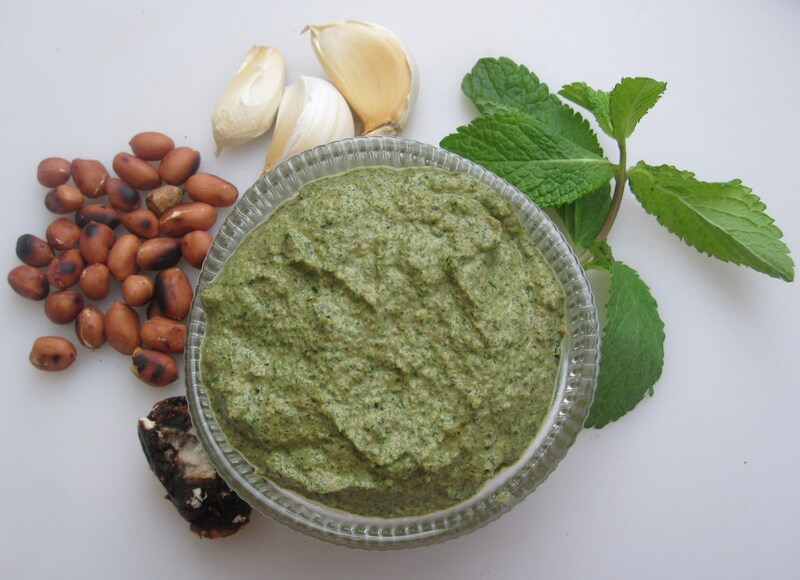 This gives a fresh mint smell to the chutney and also the green colour of mint leaves is lost if fried longer. Red chillies can be altered according to taste. Peanuts can be made to 3/4 cup instead of 1/2 cup if more peanutty taste is preferred. Deskinned peanuts are preferred for easy grinding – those who don’t mind the taste of peanut skin can go on with the skin as I do. Saves time and energy in de-skinning. Those with peanut allergy – please avoid this recipe. 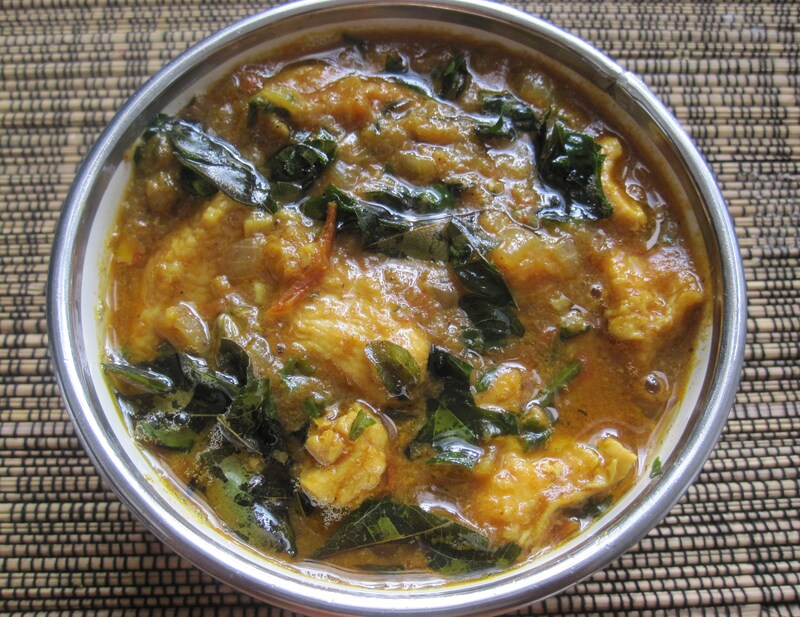 After thuvayal, came kozhi kuzhambu – quick and easy chicken curry. Not a time consuming dish at all.. just keep adding one ingredient after the other to the hot oil in the kadai, close the lid and cook chicken. Simple isn’t it? 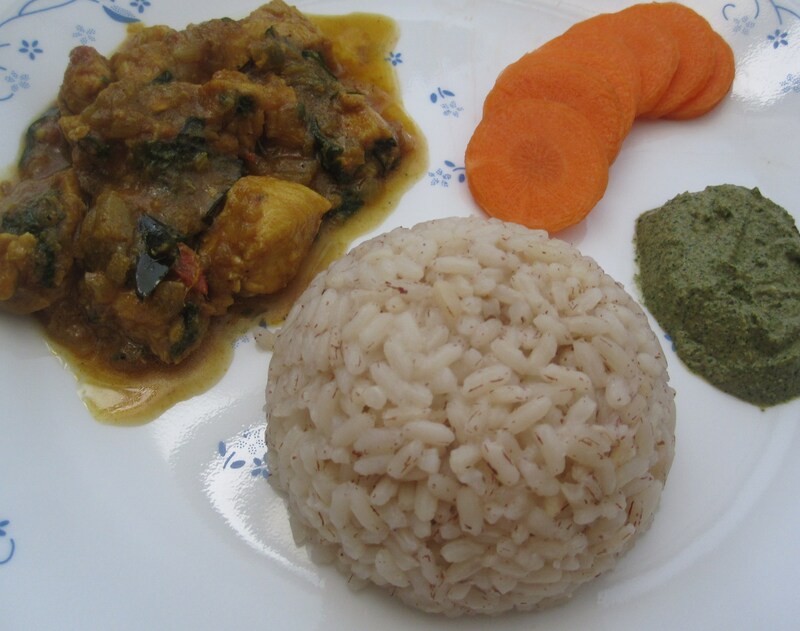 Simple Chicken Curry is ready to be served. Serve thuvayal and kozhi kuzhambu with brown rice. First course of brown rice and thuvayal tastes best with a spoon of hot ghee/clarified butter. To finish the meal, there is always thayir saadham – curd rice. Thayir saadham – Serve a small ladle of the same cooked brown rice. Mix well with generous amount of curds. This can be had with the thuvayal or chicken curry or as just plain curd rice. Generally it is had with any south indian pickle and/or mor milagai (deep-fried – dried chillies). 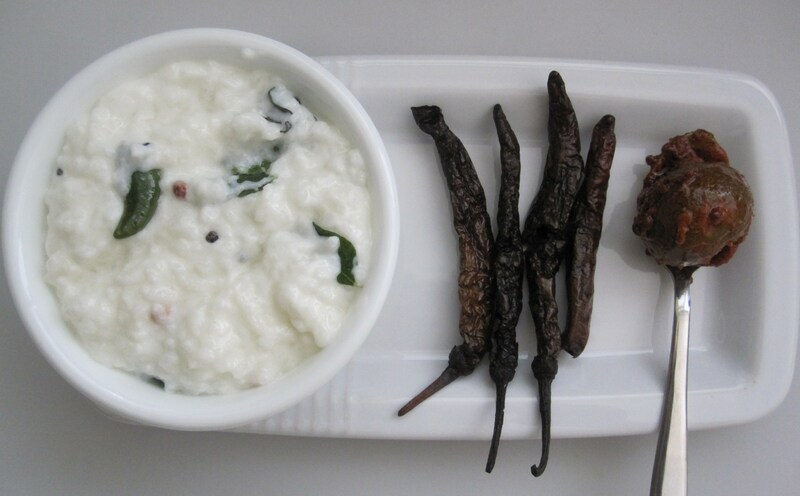 A south indian meal always ends with thayir saadham – which is rice mixed with curds/yoghurt. This aids in digestion after the intake of varied spices in a lunch and dinner platter. In my next post, I shall elaborate on the ever-special seasoned thayir saadham!